So you’ve decided to purchase a marketing automation platform. You’ve read the studies proving its benefits. You know your company needs it. Now, you just need to pick a marketing automation platform. Obviously, we’ve got a favorite product in the marketing automation space. It’s a tool we’ve built ourselves and use every single day. But for the moment, we’re going to hold off on recommending our particular solution. That’s because this guide is for you. It’s written purely to walk you through the questions you’ll need to ask and answer if you want to pick the best marketing automation system for you. Note that we said, “for you.” Because what’s best for your competitors might not be best for you. 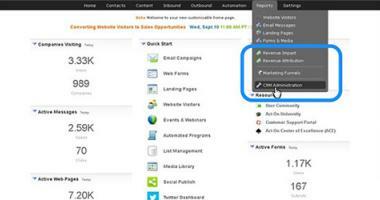 The ideal marketing automation platform for your company will depend on many things. Like your company’s size, your database size, your CRM, and how sophisticated you want your marketing automation to get. The solution you pick will also need to grow with you. That can be a big challenge. It’s one thing to find a solution you’ll be happy with today. It’s quite another thing to be happy with that same software solution two or three years from now. But it’s not impossible. It’s not even all that hard. What looks like a very complicated decision can become quite simple once you’ve answered a few questions. One last word before we jump in: A lot of this “pre-purchase homework” can be … less than fun. A bit tedious, in fact. You may already have a hunch about which solution you want, and you don’t really feel like slogging through any more specs to back it up. That’s understandable. But stay with us. Doing your research now might be less enjoyable than just picking your favorite and moving on, but this is the groundwork that will determine whether you’re successful later on. It might also (ahem) make you look very good once the solution is finally up and running. This one key question should determine which solution you choose more than anything else. So think hard, consult with teammates and senior staff, and agree on three core goals for your new marketing automation initiative. 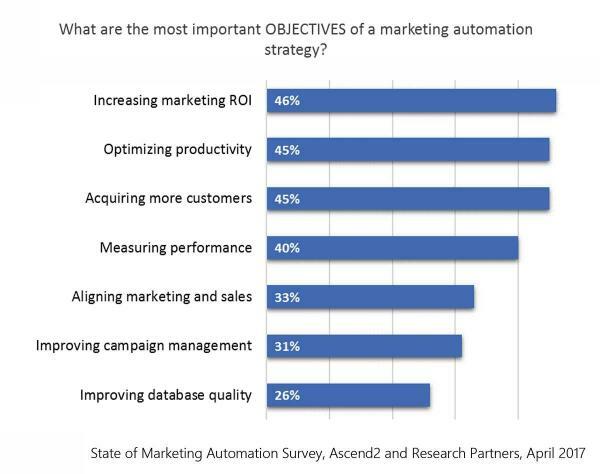 Each of those priorities has a lot of influence over which marketing automation package you’ll pick. This new software can’t be crazy expensive, either on the front end or in recurring costs. 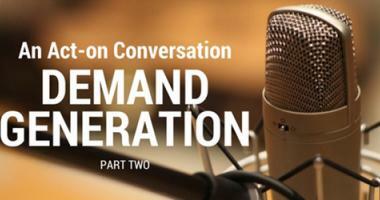 If it’s too expensive, it’ll be even harder to improve ROI. It can’t take forever to implement. Time is money. If you lose $100K in employee hours implementing this thing over the next six months, that’s going to all but cripple your ROI. It can’t cost too much to implement. 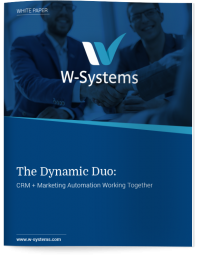 So, your existing CRM had better be able to talk to your new marketing automation platform ― without $50,000 in custom coding. It has to have low per-user costs. You need everybody on your team to be able to use this thing. The automation platform needs to be easy to use. You can’t afford to hire someone with crazy-advanced skills and a huge salary to manage the marketing automation system. You also cannot afford to spend hundreds of precious employee hours on training. The issue of implementation time. 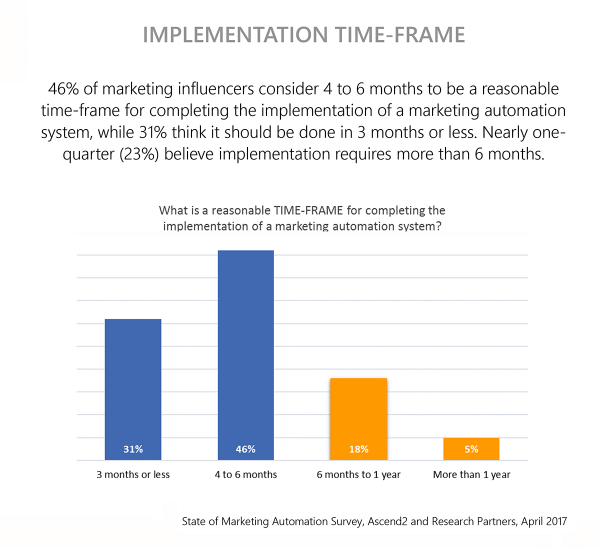 Obviously, if it takes you six months to implement a marketing automation program, that’s not as productive as if you picked a platform that could be implemented in, say, three months. Ease of use. If a system is very hard to use, or can only be used by one or two people, that’s clearly going to cut into your productivity. By a lot. It means you’ll probably have a bottleneck of requests going through that one marketing automation expert. That makes for poor productivity, but it also means your team is far less likely to use your fancy new software … which means they’re even less likely to get returns from it. Ugh. How flexible is the system? This isn’t a productivity issue now, but it will be later. As you think about living with this new MA platform over the years, consider how easy will it be to update, change, or even tweak it. As you know, if there’s one constant in marketing, it’s change. Any new system needs to be ready for all those changes, including the ones you can’t foresee now. 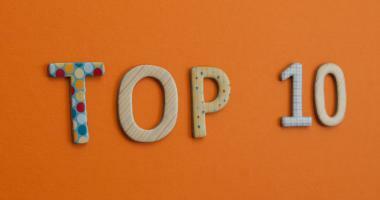 that implementing a marketing automation system in three months or less is fast. 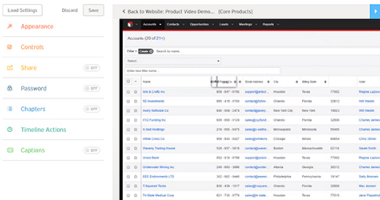 Can this new marketing automation platform help you reduce the length of the sales cycle? Don’t just say “yes” here ― get specific about which features of the different platforms you’re comparing will make that happen. Can this new MA platform make it easier for you to track what’s really happening along the buyer’s journey? Again, don’t just give this question an off-the-cuff “yes.” Get specific. And if you can’t get specific with the information you have now, go back to each vendor and get an answer. Preferably, be shown by their team how your solution will work. Is the platform good at helping you keep customers and expand their business? Getting more customers is good, but keeping more customers is even better. And getting more business from those existing customers? That’s the best of all. Can your new MA platform support loyalty marketing, or even do expand marketing? Find out before you buy! Of all the criteria mentioned here, the ease of use and time to implementation (aka “time to value,” or TTV) are the often the most important. That’s what Act-On discovered when they crunched the numbers from research by Forrester and G2Crowd. 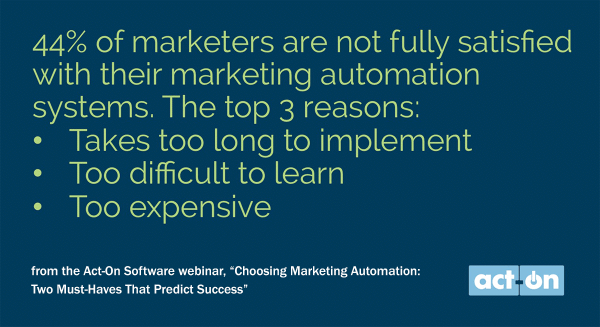 The webinar “Choosing Marketing Automation: Two Must-Haves that Predict Success” and this companion ebook outline that research and go into detail about how marketers can evaluate marketing automation platforms through that lens.